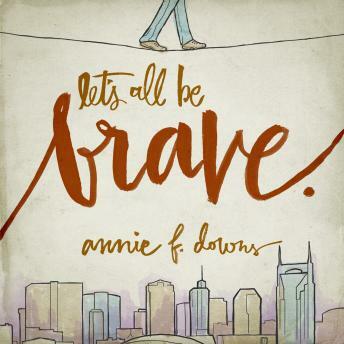 Annie F. Downs admits she's not exactly the bravest girl in the world. She still cries sometimes when she leaves her parents' home in Georgia, she's never jumped out of a plane, and she only rides roller coasters to impress boys. But Annie knows that courage resides inside each and every one of us, and she's on a mission to triumph over her own fears while encouraging listeners to do the same. As a single young woman, writer, speaker, and blogger, Annie F. Downs shares her journey toward bravery with honesty and humor. Using wonderful stories from her own life, contemporary real-life examples, and fascinating historical and biblical references, Annie encourages us to grab hold of the brave life that we desperately desire. How often does fear hold us back from the very things we most want to taste, touch, and experience? The call to be brave isn't just for one person-it's for everyone. Let's All Be Brave is more than a book; it's a battle cry. Annie challenges us to live boldly, she calls us to step into those places that require courage, and she gives us the help to take the next step forward-even when it's scary.